The Murray Brook deposit remains open to the northwest and there is excellent potential to add additional resources with continued drilling. January 23, 2012, Vancouver, Canada. -- El Niño Ventures Inc. ("ELN"and the "Company") (TSX.V: ELN; OTCQX:ELNOF Frankfurt: E7Q) is pleased to announce significant diamond drill results of the 2011 drill program on the Murray Brook massive-sulfide deposit located in the Bathurst Mining Camp in New Brunswick, Canada. Votorantim Metals Canada Inc (VM Canada) is the operator of the program. 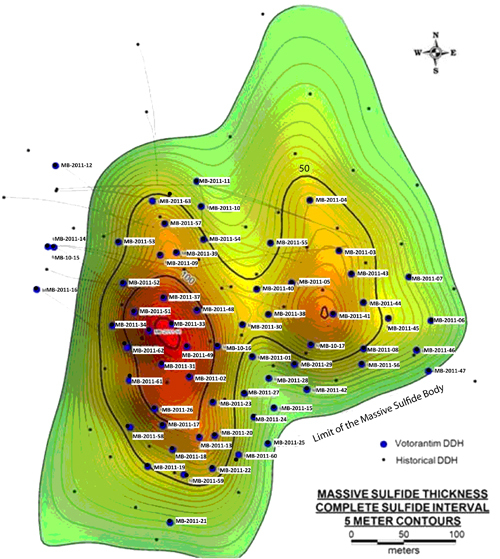 The entire 2011 program consisted of 60 vertical drill holes, totalling 10,327.5 metres with the ultimate objective of updating the mineral resources at Murray Brook. Data from the 2011 drilling program has been delivered to P&E Mining Consultants Inc. (Brampton) Engineering for an NI43-101 mineral resource update in Q1 2012. Table 1 below illustrates significant composite drill intercepts from the 2011 spring-summer drilling program. The deposit remains open to the northwest and there is good potential to add additional resources with continued drilling. A $3.0 million budget has been approved for 2012-2013 exploration program that includes $2.5 million budgeted for drilling measured resources at the Murray Brook deposit and $500,000 exploration program on Murray Brook and Camel Back exploration claims defined by the option agreement with Murray Brook Minerals. The objective is to search for covered giant VMS deposits that might occur at depths of up to 150 metres. The area is located between the Murray Brook massive sulfide deposit, which with historic (not NI43-101 compliant) resources at 25 million tonnes, was the 5th largest in the Bathurst Mining Camp (BMC), and the nearby Caribou deposit with total historic resources estimated at 65 million tonnes which is considered to be the 2nd largest in the BMC. The sample process follows these procedures. Mineralized samples are selected for assay from the NQ core and sawed with a diamond blade rock saw. The samples are bagged in a plastic sample bag with the sample number and sealed with a plastic locking tie. Six or seven rock samples are placed in a rice bag and sealed with a Bag Guard Seal with a 7-digit number. The rice bag is sealed in a plastic bucket container and numbered. Shipments of approximately 20 buckets are sent by Day and Ross via their secure shipping facilities to TSL in Saskatoon, Saskatchewan. TSL would report to VM Canada if there was any evidence of tampering of which no reports have been received to date. Quality control is monitored by submitting a field blank, a standard and a duplicate sample with each 30 sample batch sent to the laboratory for analysis. The field blank is barren coarse-quartz sand. The field duplicate is a sawn, quarter split of a core sample selected from the same batch. Two types of standards, ME-6 low grade and ME-7 medium grade, were purchased from Canadian Resource Laboratories, Langley, British Columbia. The OREAS_38, high-grade standard was purchased from Analytical Solutions Ltd, Toronto, Ontario. The quality control sample results are monitored for any assay problems as the data is received from the laboratory. Assay values returned for blanks are at or below the detection limit. Variability of assay values returned for standards are within plus or minus 5% which is considered to be within an acceptable range of analytical error. This news release has been reviewed and approved for technical content by Ali-Hassanalizadeh MSc., MBA, P.Geo, a qualified person under the provisions of National Instrument 43-101. Figure 1- Land tenure map showing the location of the Murray Brook Project in the Bathurst Mining Camp. Figure 2- Collar location map of Murray Brook diamond drill holes. In February 2011, ELN announced that a $5,000,000 exploration program on the Bathurst Mining Camp Base Metals Project has begun consisting of airborne and ground geophysics and will include a 10,000 metre drill program which is currently underway. (See press release dated February 23, 2011). Airborne geophysics is completed and survey results are pending. Under Votorantimʹs Option and Joint Venture Agreement with Murray Brook Minerals and Murray Brook Resources, both privately held companies, Votorantim can earn a 50% interest in the properties by funding $2,250,000 in exploration expenditures and making payments totalling $300,000 over a three year period that commenced November 1 2010. Votorantim can earn an additional 20% interest in the Properties by funding an additional $2,250,000 in exploration expenditures over an additional two year period. ELN has elected to enter into a participation agreement wherein it can earn 50% of Votorantim's interest by paying 50% of the costs incurred by Votorantim in the Option and Joint Venture Agreement. The Murray Brook deposit is a polymetallic, volcanic hosted massive-sulfide deposit and is the fifth largest in the Bathurst Mining Camp. The property is located approximately 60 km west of Bathurst New Brunswick, in Restigouche County, within the Bathurst Mining Camp. An existing gravel road accesses the property from a paved highway. An electricity grid is nearby, as are communities with goods, services and skilled labor. The gossan zone was removed during the open-pit mining operations carried out by Novagold Resources Inc. during the early 1990s. The hanging wall is moderately chloritic and is locally intensely deformed. The foot wall consists of fine grained, felsic tuff and tuffaceous sediments with moderate to strong chlorite and sericite alteration. Sulfides are mainly fine grained, massive, vaguely laminated pyrite with disseminated and banded sphalerite, chalcopyrite and galena. Removal of the gossan also removed any evidence of previous drilling within the shallow pit area. Consequently, VM Canada's due diligence process to acquire the Murray Brook deposit required the confirmation of several historically, reported drill results, in addition to compilation of previous work. Significant drill results from the due diligence, drill twin-hole program included massive sulfide intersections that were similar in width, position and positively confirmed the grades for copper, lead, zinc, gold and silver reported from the three previously drilled holes. In January 2011, ELN announced that it has provided notice to Votorantim Metals Canada Inc. (Votorantim) to enter into a Participation Agreement on the Murray Brook Massive Sulfide Polymetallic deposit situated in the Bathurst Mining Camp in New Brunswick, Canada. (See press release dated January 20, 2011). The first phase of the 2011 drill program was completed in Spring/Summer 2011 and significant intersections of zinc, copper, lead, gold and silver were reported. The second phase of the drilling program was initiated in September 2011 and results are expected before year end. (See press release dated August 30, 2011). The Murray Brook 2012 Exploration program budget is currently set at $3,000,000. 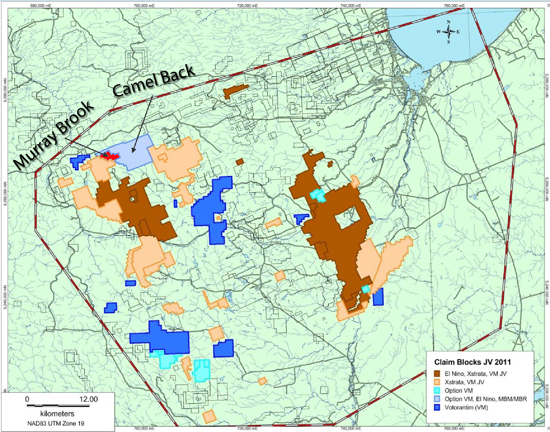 This program will consist of a multiphase drill program and a NI43-101 resource estimate with preliminary tonnage and grade calculations and exploration program including mapping and prospecting on Camel Back claims. Votorantim Metals Canada Inc. is a subsidiary of Votorantim Metals; a company that is part of the Votorantim Group that was founded in Brazil in 1918 operates in twenty countries and has over forty thousand employees. Votorantim Metals is the largest electrolytic-nickel producer in Latin America and one of the world's leaders in the production of zinc, aluminium and nickel.